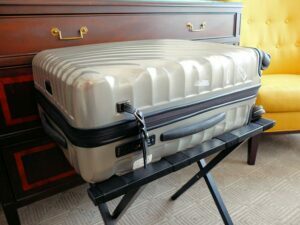 Luggage storage in New York can be found at various locations in Manhattan. Are you passing through and want to do some sightseeing without having to bring your bags? Or did you rent an apartment that you have to check out of but you’re not flying until later? Then there are various places in New York where you can temporarily leave your suitcase. There aren’t any lockers for baggage at Grand Central Terminal or Port Authority, for example. However, there are alternatives. For just $1 per hour you can store your luggage in Manhattan or a neighbouring area. Where can you leave your baggage? Knock Knock New York offers a large selection of storage locations in Manhattan. They also have various branches in other neighbourhoods of the city and continue to expand their reach. You can choose to store your cases close to Port Authority, Penn Station or Wall Street. In addition, there are even places to store your luggage in New Jersey and Williamsburg. All storage locations are monitored, so your cases are safely stored while you continue to enjoy everything New York has to offer. Making use of luggage storage in New York is simple. On the website, search for a storage location in your desired area. In a few easy steps, you can then create an account and will receive a QR-code per e-mail. Scan this code on your phone at the location, where you’ll receive a tie-wrap with a unique number-code which you use to securely lock up your baggage. Collect your luggage whenever you want (although, do be aware of the closing time of the storage location! ), re-scan your QR-code and pay the total price for the number of hours that you have used. It couldn’t be easier! The storage costs just $1 per piece of luggage, per hour and insurance is included in this price. In addition, should your plans change, you don’t need to contact them, they won’t charge for a ‘no show’.